Image by yellowcloud, available under a Creative Commons Attribution-2.0 Generic license. I’m one proud Mama. Last week, I noticed that my one and only Lithops had split open and I could see new leaves I immediately did a happy dance. Since Lithops is the genus, even a singular plant is still termed Lithops. This Lithops was a gift from Adam and Davis of Crown Flora Studio and I am forever grateful. I would love to have a bowl full of Lithops one day, so I’m on the hunt for more. Unfortunately, I can’t seem to find any here in Ottawa. After a few months of searching I found a nursery in British Columbia that have them and I will definitely be ordering from them once the temperature is warm enough. My Lithops. You can see the new leaves in the opening. My Lithops is among the few plants I sent to my sister-in-law’s house for some sun therapy this winter and it paid off. Lithops, also called living stones, are members of the plant family Aizoaceae. They are succulents native to south Africa. Their appearance serves as protection from animals who would otherwise eat them. By looking like stones, they blend in with their environment causing animals to overlook them. Pretty neat! These plants just fascinate me. Their fleshy leaves allow them to store water which allows them to survive in very dry areas. Photo by yellowcloud, available under a Creative Commons Attribution-2.0 Generic license. What you see of the plant are actually two leaves fused together and you can see where the leaves meet at the top of the plant where you will find a slit. Lithops have no stem so the roots join directly to the leaves. Lithops are perennials and so they grow new leaves each year. They grow all year except in spring and early summer where they go dormant. They resume growth again in the fall. Lithops need direct sunlight in order to grow properly. If not they become etiolated, they will elongate and lean towards sunlight. The thing to be most careful about is how and when Lithops are watered. They require different amounts of water at different stages of their life cycle. When dormant, you only water sparingly, just enough to prevent the leaves from shrivelling completely. When flowering, it is safe to water but allow the soil to dry out in between waterings. I did not know this but according to lithops.info, as the new leaves begin to emerge in winter, they should not be watered, even if the soil is extremely dry and the old leaves look withered. The new leaves draw moisture from the old leaves. Yikes! I watered mine lightly lastweek in order to keep the roots alive. I hope that doesn’t disturb the growth of the new leaves too much. Will keep you posted on that. 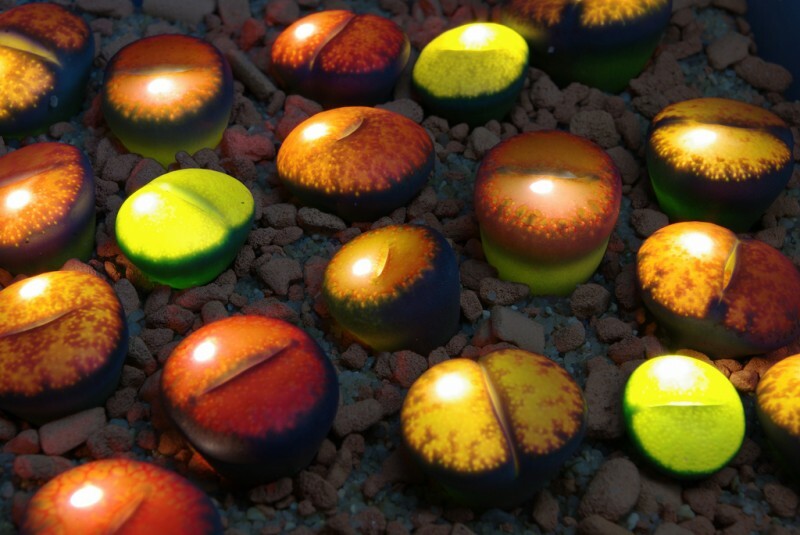 “Lithops Glow”. Photo by Yellowcloud, available under a Creative Commons Attribution-2.0 Generic license. One fun fact. Did you know Lithops glow? Me neither until I saw a photo of glowing Lithops (above) from yellow cloud’s flickr account. Yellowcloud has a great collection of Lithops with tons of photos of illuminated Lithops. 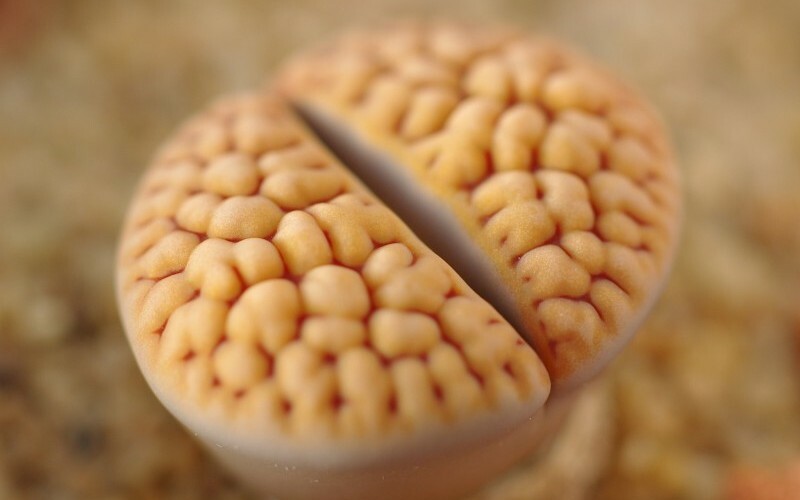 If you are at all interested in Lithops, I recommend you check it out his Lithops albums on flickr. Apparently if you shine a torch-light on their windows (the translucent top surface), they will glow for you. Any one tried this yet? I will be trying that on my Lithops soon. If you have Lithops, share pictures of them below in the comment box.